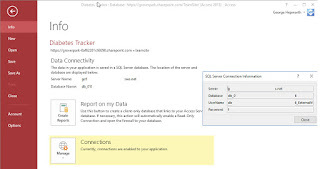 ﻿﻿Recently, a poster at Utter Access asked for help moving Access tables from an existing database to SharePoint tables (or more accurately, to SharePoint lists). His goal was to link to those tables in a Hybrid Access database. One of the issues raised was the supposed limit on the number of records you can export. Fortunately, a couple of really knowledgeable people, Albert Kallal and Bonnie Hicks, stepped in and helped address the poster’s questions. I'm delighted to announce publication of a new, first-of-its-kind, book on Access 2010 and SharePoint 2010. It's been a long time in the writing, but we finally wrapped it up. Sometime I just want to be single, okay? On the surface, it appears that VBA does not like it very much when you want to have a Singleton class. Whenever I write a class module, which is kind of rare given the general patterns in Access/VBA development, it's almost inevitable I want a Singleton. The only reason it's a class in first place is because I need some variables declared WithEvents. We can't do that in a standard module, so it has to be a class module. So, what's got my dander up today? I’m glad you asked. Excel is NOT a database. You can't import Excel spreadsheets into Access and call that a database. You can't create "spreadsheets" directly in Access and call that a database. I wish more people understood that. It would make my blood pressure go down, probably down a lot.